I wanted to get a few pairs of slippers for my Mum. There was a good range at good prices and no shortage of sizes. The staff were very friendly and helpful and I had a perfect shopping experience. At first i couldnt fine the right shoe size for my Sons but the staff helped me. The colour of the shoes really made the whole store stand out. Really poor service again from this store. I'd visited it the previous week for shoes but my size wasn't available. By the look of boredom and unfriendliness of the two gossiping females who were "working" there at the time, I felt that it would be almost criminal to dare ask either one of them if they had the size of shoes I needed. I decided to try again this evening to buy the shoes I wanted. There were no visible staff members on the shop floor and when one did appear, she seemed annoyed that she had customers waiting to pay. The ladies in front of me waited an age as well as myself to be served, whilst hearing the so-called assistant call someone in a back room to "come out and serve." I should have walked out and not bothered buying what I did! Such miserable and moody staff serving you begrudgingly without a smile or acknowledgement is so off putting. The staff at this store always present an unfriendly demeanour and appear irritated when a customer is waiting to pay for items. I worked in retail and never treated customers this way. Appalling service from this store - wouldn't recommend to anyone! Brought two pairs of shoes total cost £36.98. I was asked if I wanted to purchase a carrier bag for 5p. Not impressed! I requested their boxes but they had been broken up. The weather was lousy out heavy rain. My choice, walk out of the shop with two pairs of shoes in hand with tags still on as if I'd stolen them and also get them soaking wet before they'd been even worn. Again not impressed! I had to insist on using two used clear plastic bags which slippers or a bag had come in. Also I had to insist the assistant wrote on the receipt that one pair of shoes were already dirty and marked on the sole in case I needed to bring them back. 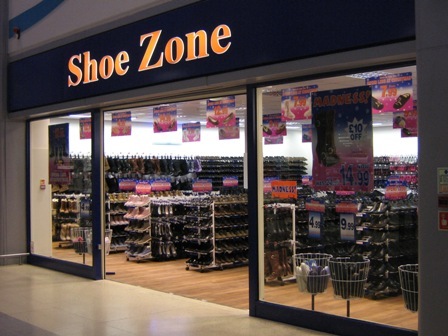 On the whole, not a good experience of the shop Shoe Zone. STORE ITSELF WAS GOOD. STAFF SHOCKING. TWO ASSISTANTS AT THE TILL. MISERABLE AND MOANING TO EACH OTHER. WAS ONLY SPOKEN TO WHEN ASKED FOR PAYMENT. MAY ASWELL BEEN SELFSERVE FOR THE ATTENTION I GOT. THEN CONTINUED TO MOAN ABOUT NEEDING A DRINK. COULD TELL YOU MORE ABOUT WOES THEN THE OFFER ON CERTAIN ITEMS IN STORE, ONE OF WHICH I PURCHASED. WOULD HAVE TOOK THE OFFER UP BUT NO ONE MENTIONED IT AND DIDNT WANT TO ASK AND INTERUPT THE CONVERSATION GOING ON. USUALLY SHOP IN HINCKLEY. WHAT A DIFFERENCE A TOWN MAKES!!! !